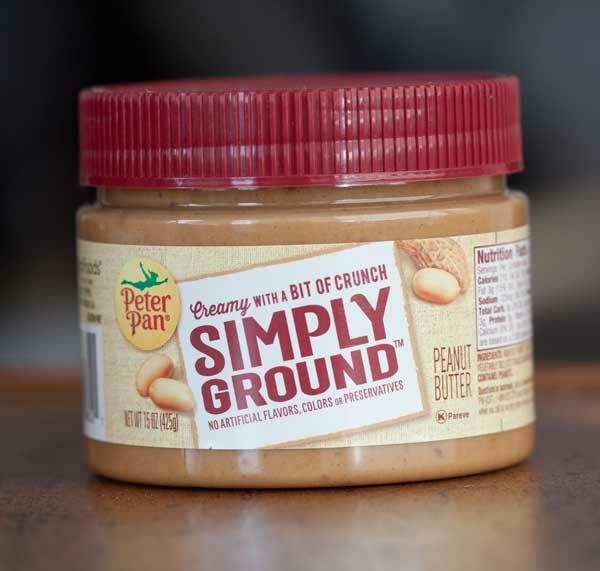 As someone who spends way too much time in the peanut butter aisle perusing all the new varieties trying to decide which one will make my daily toast more exciting, I was very happy when Peter Pan asked if I’d review their new Simply Ground. Thanks to its distinctive packaging, I’d already spotted Simply Ground. It comes in a short, wide mouth jar with a red top. However, given the name and the shape of the jar, I assumed it was peanut powder or just plain ground peanuts. But it’s not. 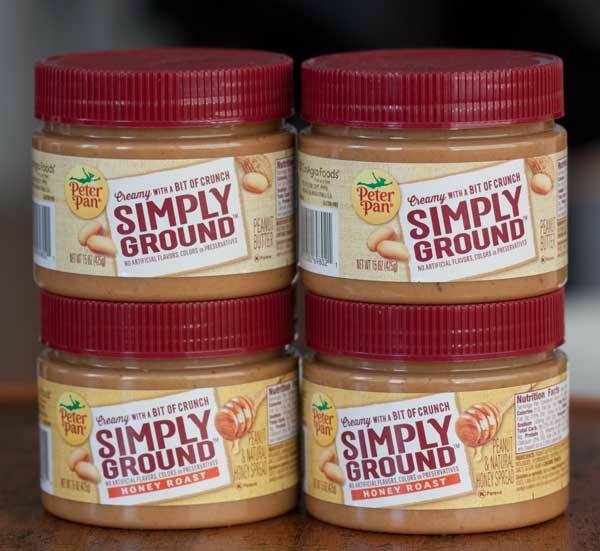 Simply Ground is a sweetened peanut butter made with very finely ground peanuts. Compared to regular chunky peanut butter, it’s a bit easier to spread and less likely to tear bread. In addition, Simply Ground is a no-stir peanut butter, so if you are among the segment of folks who don’t like to stir the oil that separates from the ground peanuts, this one’s for you. Described as “creamy with a bit of crunch”, Simply Ground is all about texture. 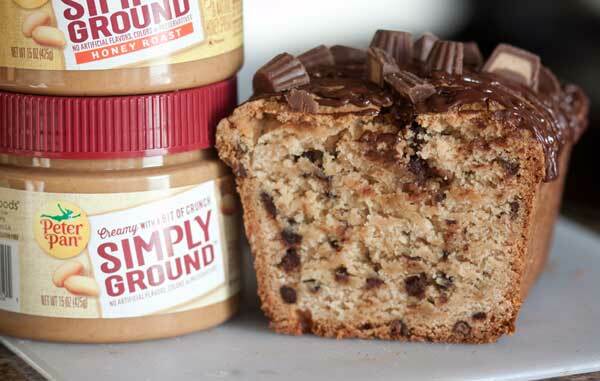 However, it has a great flavor and worked quite nicely in this peanut butter pound cake. 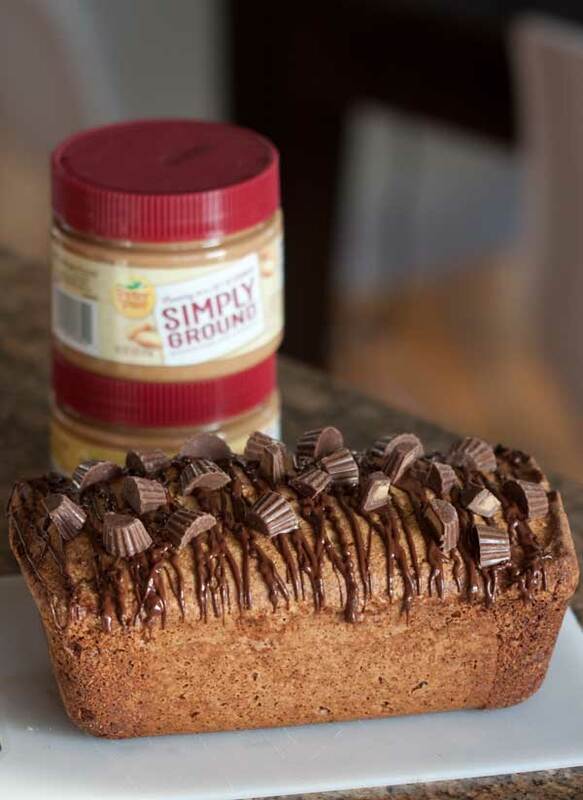 The original version from Peter Pan’s recipe collection is for a large round peanut butter pound cake with peanut butter glaze, but I made a loaf shaped peanut butter chocolate chip pound cake using the Simply Ground. Sometimes peanut butter cakes can be dry, but this one wasn’t. It was dense and heavy and had a nice shape. For the granulated sugar I used an unprocessed brand from Aldi called Zulka Morena, so my crumb is a little darker than the one in Peter Pan’s picture, but in my opinion that was a plus. Thanks to Peter Pan for the recipe and for the introduction to Simply Ground. A rich peanut butter flavored pound cake dotted with mini chocolate chips and topped with melted chocolate and mini peanut butter cups. This peanut butter cake is baked in a loaf pan. Preheat oven to 325°F. Grease and flour an 8 ½ by 4 ½ inch loaf pan. Alternately, use a 9x5 inch loaf pan. I used an 8x4 inch pan and it was a bit too small. Beat peanut butter and butter with electric mixer at medium speed, about 2 minutes or until creamy. Gradually add sugar, beating 5 to 7 minutes. Add eggs, 1 at a time, beating just until yellow disappears. Gradually add flour mixture, stirring just until mixed. Stir in vanilla. Pour batter into prepared pan. Bake 1 hour and 20 minutes to 1 hour and 25 minutes or until long wooden pick inserted in center comes out clean. Note: This really does take a while to bake, so just keep testing it until it is done and lay foil over it if it starts browning too fast. Cool in pan on wire rack 10 to 15 minutes; remove from pan, and cool completely on wire rack. For the topping, combine 1/3 cup of miniature chocolate chips (or 2 oz of your favorite semisweet chocolate) with a teaspoon of coconut oil or shortening. Melt in the microwave using 50% power and stirring every 30 to 40 seconds. Drizzle over cooled cake, then sprinkle cut mini peanut butter cups over the top. The texture sounds nice for spreading. How sweet is it? We don’t eat much PB these days and of course we have a favorite but I’m open to trying something new. The Pound cake looks good. I don’t think I’ve ever had PB cake of any kind!